I apologize in advance that my skin looks really odd in this picture. I was trying to color correct the picture so that the color of the polish would be accurate. 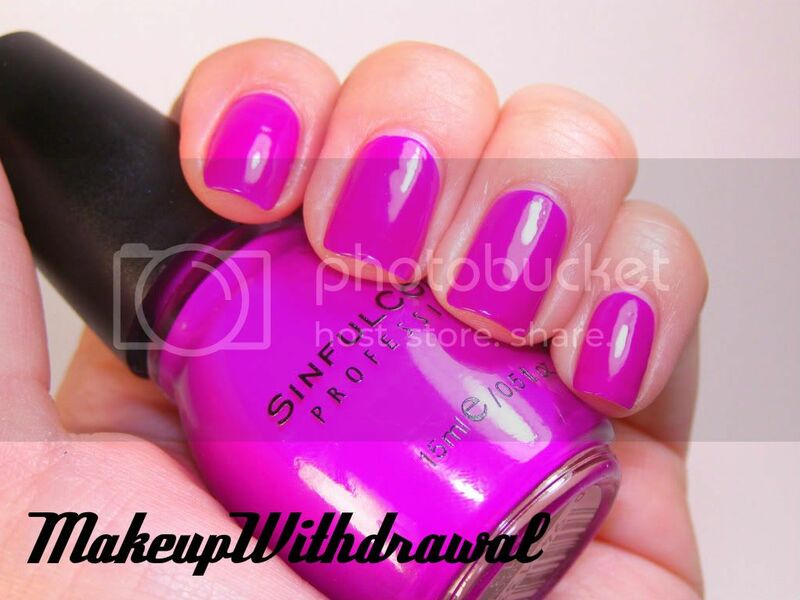 This is Dream On, from Sinful Colors. It's a bit darker than shown, partly because I took this picture close to a light source. I love Dream On. In fact, it's a polish many of my friends own. It's a neon purple- fuchsia, so beautiful outdoors under the sun, somewhat darker indoors. For me, it takes a full three coats because of the odd matte-ish way that neons dry and mess with my brush strokes. Top it off with a super shiny top coat, and all the brush strokes disappear. Thank goodness. Truly, one of my favorite Sinful Colors. By the way, this is my last installment of Sinful for a while. I'm all polished out, I need to go back to reviewing other products and EOTDs. Have a wonderful Saturday night!